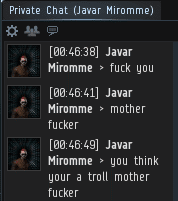 It was a tough day to be Javar Miromme. 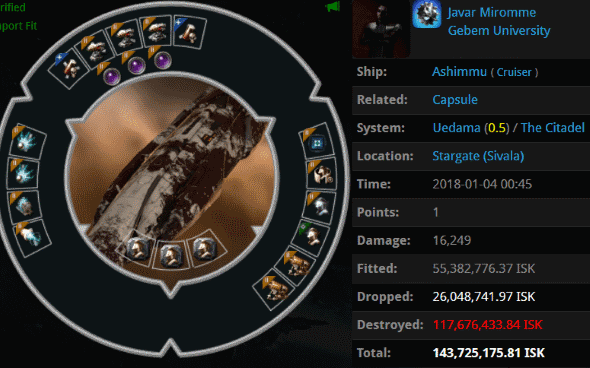 Javar's Ashimmu was ambushed by a group of Catalysts from the mighty CODE. alliance. Javar should've known that something like this would happen. After all, he was loitering at a stargate in Uedama, and he had a history of engaging in Anti-Ganking activities. 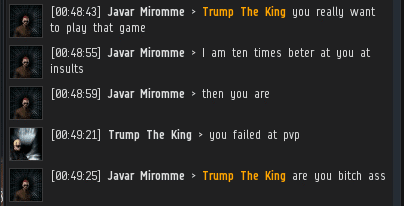 One of the Catalyst pilots, Trump The King, sent Javar a private convo request. Agent Trump wanted to make sure that there wasn't any confusion about the gank. Too late. Trump chastened the carebear in the gentlest terms he could think of on such short notice. Trump offered some constructive criticism of Javar's gameplay in the form of an "after action report". However, it appeared that Javar was the type who doesn't handle criticism very well. The (former) Ashimmu pilot got off a parting shot and terminated the convo--without purchasing a mining permit. Now what? It occurred to our Agent that maybe Javar's finger slipped and he closed the convo by accident. He extended the carebear another opportunity to explain himself. As is usually the case in situations like these, the carebear ended up revealing more about himself than he intended. Javar's comment about our Agents made one thing crystal clear: He was motivated by envy. This revelation would prove to be very important later on. 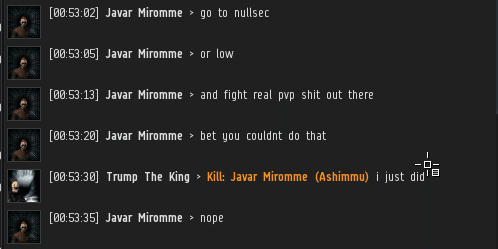 For some reason, Javar thought the battle would've gone better for him in lowsec or nullsec, where our Agents wouldn't have needed to deal with faction police or CONCORD. Trump offered another critique of Javar's battle tactics, free of charge: Why didn't he activate some modules or something? Many of our most prominent elite PvP'ers get accused of cheating. These hackusations are actually a compliment in disguise. Ordinary EVE players can't imagine anyone being this good at the game. It wasn't obvious what Javar was trying to accomplish with all of his bluster. He didn't ask for reimbursement or anything. The carebear exhibited a strange mixture of hostility, jealousy, and admiration. This made him unpredictable, which, in turn, made him dangerous. For Agent Trump had no idea that Javar Miromme was about to return to Uedama to seek his revenge--and that revenge would be sweet. This is not going to end well... for ag. Oh, and it's 'ag'. There are no caps in antiganking. If AG can't even stop themselves being ganked, how are they supposed to stop miners being ganked? Trump IS King!!! \o/ Praise James! wow just wow. 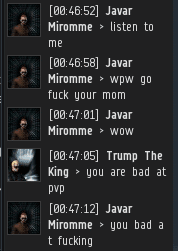 antigankers show again that they are toxic and bad at eve. anyone else see thomas's fail reddit post asking for more nerfs to ganking and trying to farm upvotes in anti-ganking chat?? what a grade A loser. Most folks were generous and assumed Thomas was joking. The rest tore him to shreds. "Make autopilot warp to zero, far too many people die and feed CODE who are completely AFK, and make AFKers go invisible if they do not touch their keyboard in 3 to 5 minutes"
Amazing... As an agent I already know what James' opinion on this subject is buuuuut it would be REALLY COOL if the savior would treat us with a post on the subject in response. Since Scott Bacon and the rest of Silent Infinity has ceded High Sec to the New Order by retreating to their hovels in Provi, Thomas is really all that is left as far as "leadership" is concerned in ag (if you can call it that). This reddit post would seem to be their last hurrah of their so-called "movement". Pretty desperate. "These are good step forward toward fixing high security space. (Not james 315 space)"
Someone please tell Thomas that we are fixing high security space, and that it is James 315 space! Please elaborate on who this scott bacon dude is, I have been oit of game for a while. Ahh I see, scottbacon is just another ag sperg with no intestinal fortitude, a real chicken shitter. Don't worry he can't run far enough to hide in EVE, if hes really that cowardly he'll be easy to spot. Link please. I could use some good ag tears and people roasting him. Elon Musk has just launched the most sophisticated rocket to date, and successfully landed two boosters - meanwhile anti-gank cruiser pilots can't even activate their weapons in a video game about firing weapons at imaginary spaceships. I thought Team Tama had higher standards.